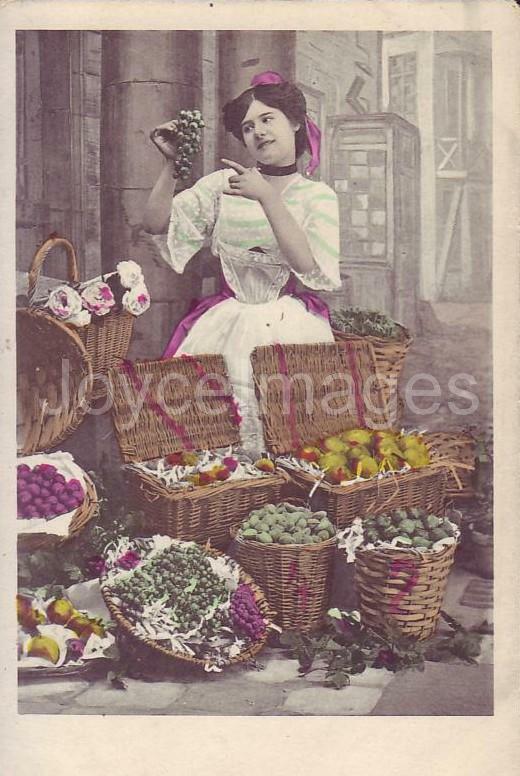 "The blonde girl in Thornton's bedded the wicker basket with rustling fibre. Blazes Boylan handed her the bottle swathed in pink tissue paper and a small jar. 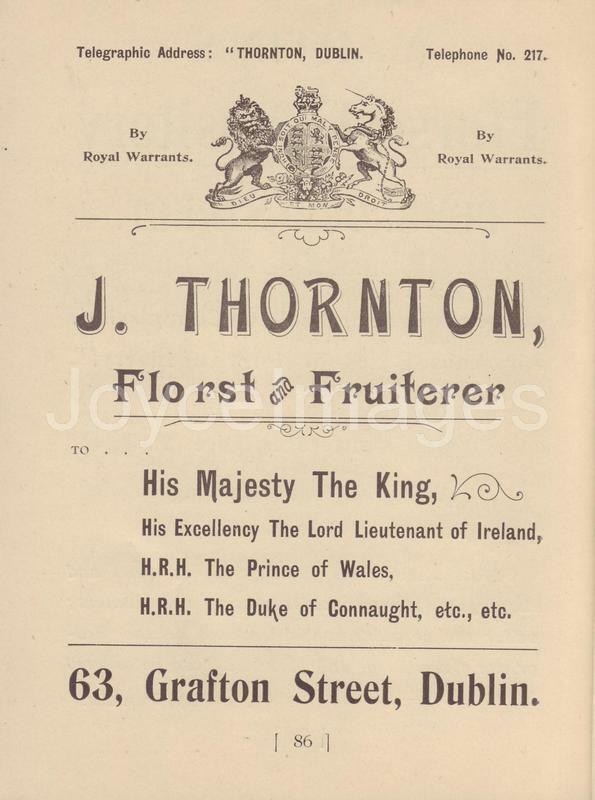 An ad for Thornton in a tourist pamphlet from 1902. We get the store's phone number 217; nowadays Dublin phone numbers have 7 digits. 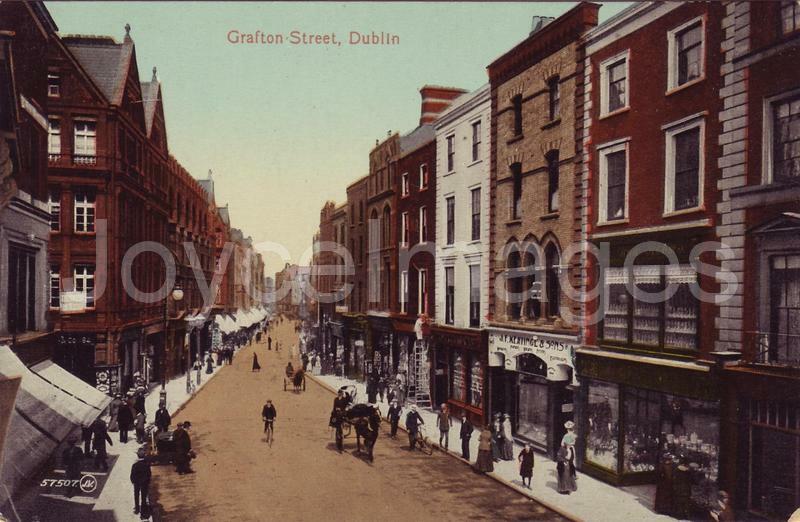 The sign hanging on a corner building, on the left side of Grafton street, indicates Thornton's. 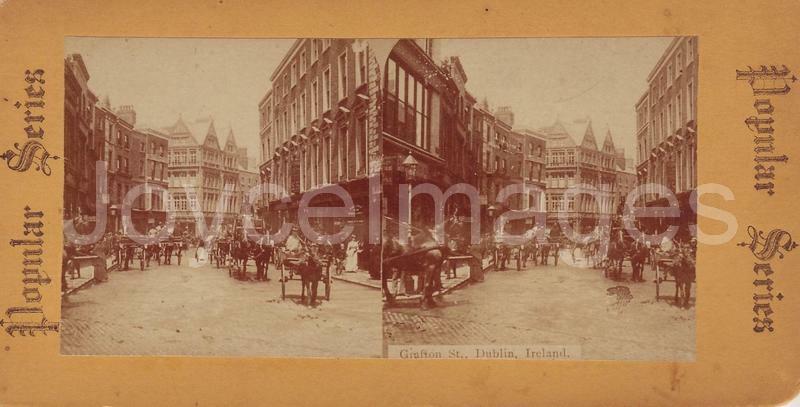 A SV of Grafton street, Thornton again on the left. "- Yes, sir, the blond girl said, and the fruit on top. - That'll do, game ball, Blazes Boylan said. 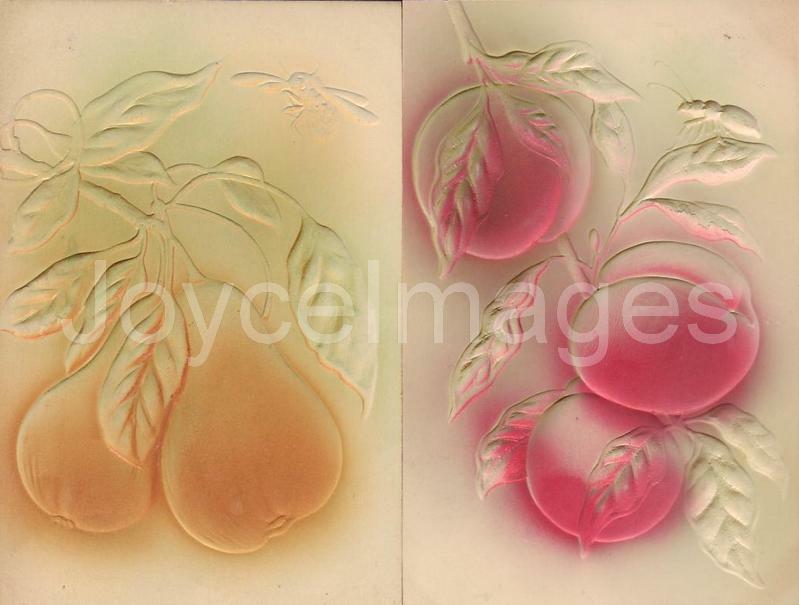 "The blond girl's slim fingers reckoned the fruits. - This for me? he asked gallantly. "- Yes, sir, she said. 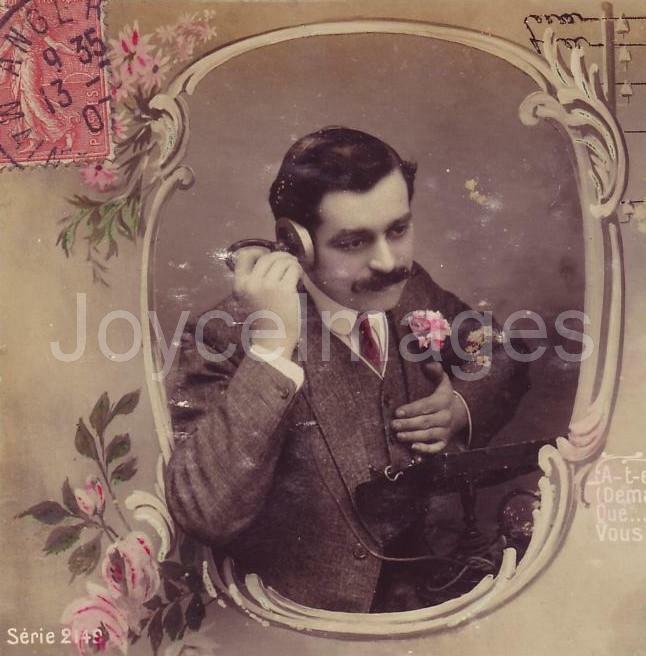 "Blazes Boylan looked in her blouse with more favour, the stalk of the red flower between his smiling teeth. "- Ma! Almidano Artifoni said. 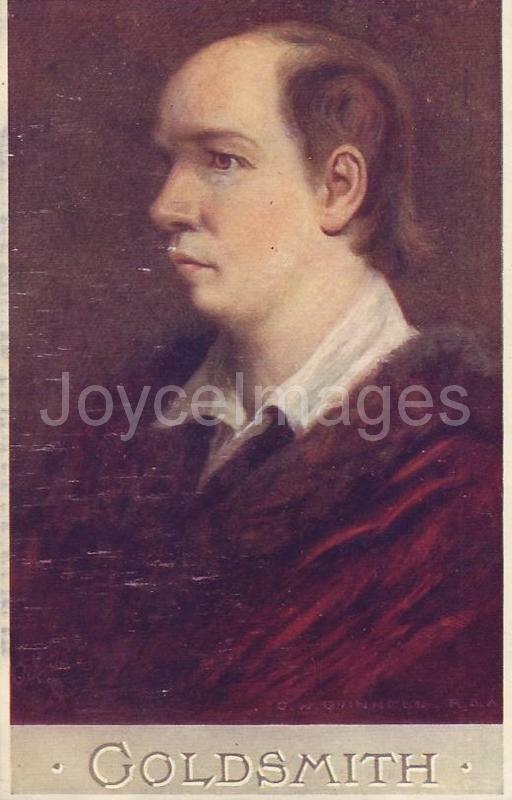 Oliver Golsmith (c.1730-1774) was an Anglo-Irish writer, poet, and physician. His best known works are the novel 'The Vicar of Wakefield' (1766), the pastoral poem 'The Deserted Village', and the plays 'The Good-Natur'd Man' (1768) and 'She Stoops to Conquer' (1771). 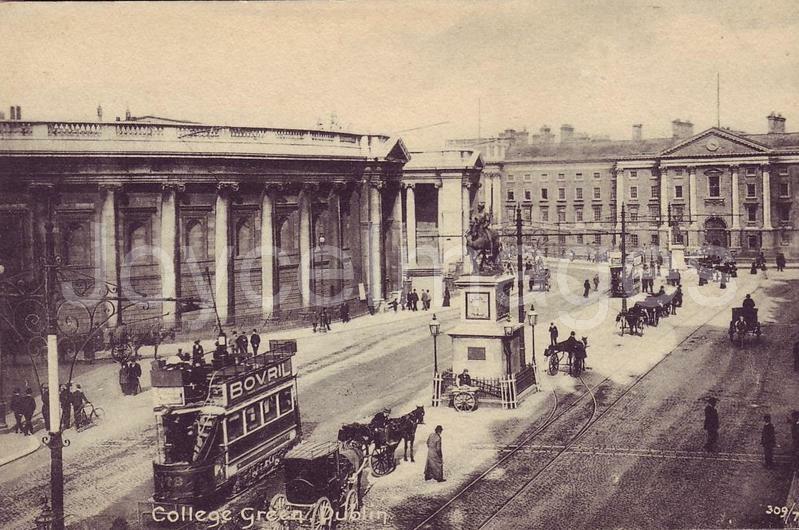 Goldsmith earned his Bachelor of Arts at Trinity College (1749), studying theology and law. He later studied (medicine) at the Univ of Edinburgh and the Univ of Leiden, and at the Univ of Padua (1755 and 1757) then toured Europe, living on his wits. 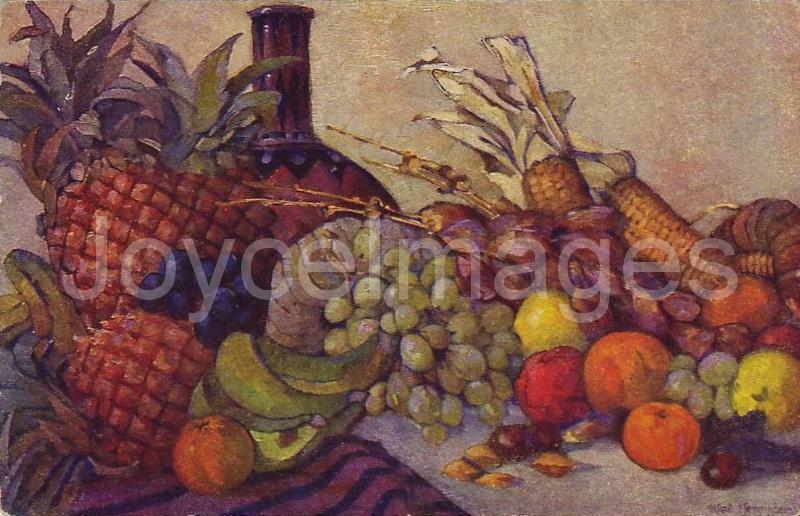 He then settled in London and worked as an apothecary's assistant. Perennially in debt and addicted to gam/bling, Goldsmith had a massive output as a hack writer for the publishers of London, but his few painstaking works earned him the company of Samuel Johnson, along with whom he was a founding member of 'The Club'. He is buried in Temple Church. This is the area where the conversation between Stephen and Artifoni takes place. The same scene in snow. A tram advertises Bovril. 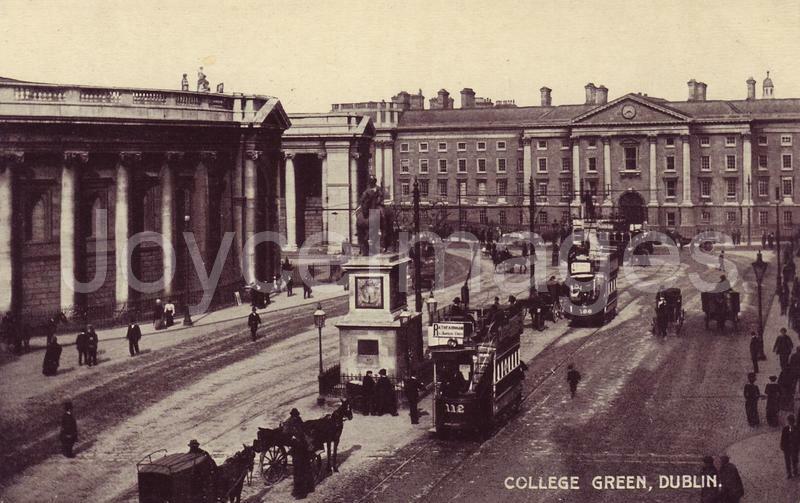 A SV showing the Bank of Ireland, taken from within the garden of Trinity. 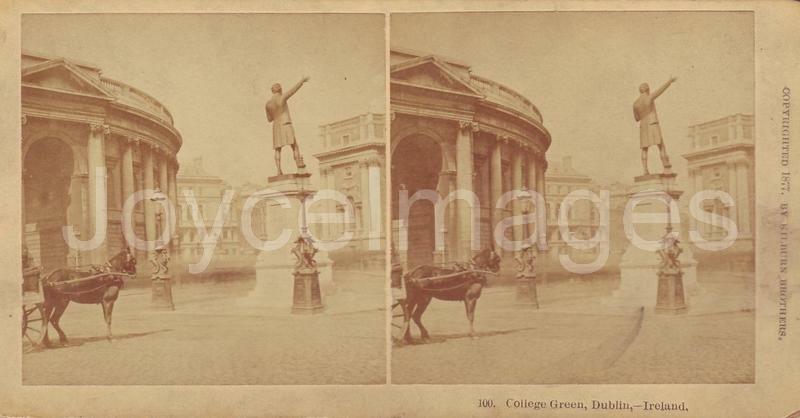 The statue of Henry Grattan was erected at College Green in 1876, the work of Dublin-born John Henry Foley (1818 - 1874). It is of bronze and not of stone. A SV from 1877 showing the stern hand of Grattan. 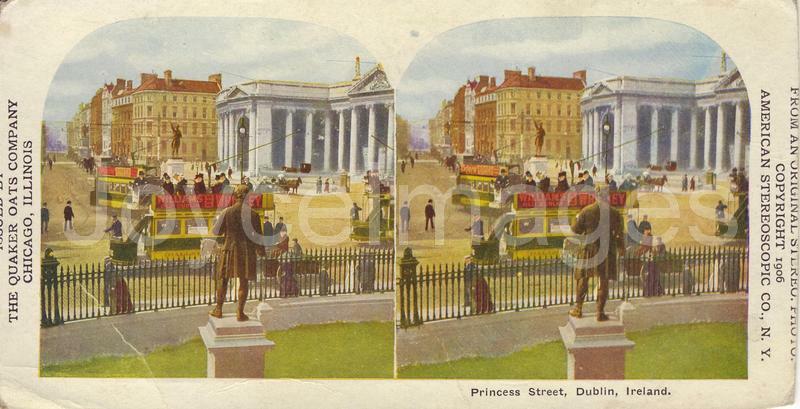 John Henry Foley was also responsible for the O'Connell monument (Sackville street), and the statues of Edmund Burke and Oliver Goldsmith (Trinity College). 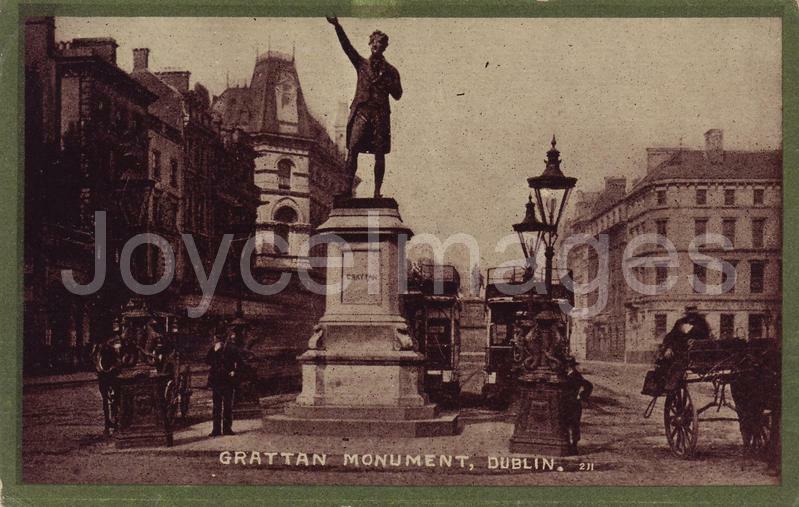 Grattan's was the first monument to an Irish nationalist in Dublin, followed by Smith O'Brien on Sackville street.